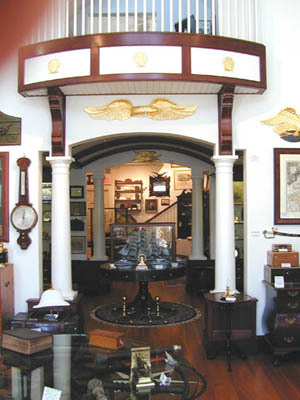 Since the age of eight years old, Richard Kahn has been dealing in and collecting fine and rare antiques. He first started attending auctions with his father in 1956 when he purchased a rare 19th century colt revolver for $5.00. He purchased his first piece of American furniture, a wonderful carved walnut side chair the following year, which by the way, he still owns. Shortly thereafter, he purchased a photograph and letter signed by his childhood hero ‘Mark Twain’ (Samuel Clements) for $3.00. In 1958, on his 10th birthday, his grandfather gave him a model 1841 Mississippi rifle made by Eli Whitney (whom he was studying at the time in school). This musket was found by his grandfather while on an Army maneuver in 1941 sticking out of the mud in a dried up river bed in Texas, not to far from the Alamo. Through research, it was discovered that the gun was most likely used by one of Sam Houston’s men during the long border wars with Mexico in the early 1840’s. This gun was a turning point in Richard’s collecting interests. Buying rare and historical antiques suddenly became a passion that has endured without interruption to this day. In 1976, Richard and his family moved to London so that he could pursue a career opportunity in the investment industry. Over the next thirteen years his collecting interests really flourished. 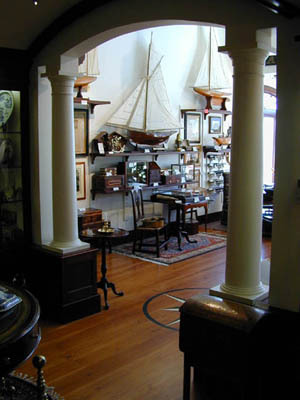 His passion for historical maritime antiques took off in 1979 when he discovered at London’s famous ‘Portobello’ market a rare engraved silver beaker once owned by legendary Cape Cod sea captain ‘Mad Jack’ Percival, captain of the U.S.S. Constitution ("Old Ironsides") from 1844-1846. Also significant in forming Richard’s enduring passion for historical objects was his discovery the next year of the long lost silver and ivory seal of the ‘Worshipful Company of Cordwainers’. This seal had been missing for over 300 years. What is most interesting about this seal was that it was once in the possession of Capt. John Smith of the Virginia Company, who had been master of this Company before leaving London on his adventures and later being saved by the Indian princess Pocahontas. In 2001, Richard officially retired after a thirty plus year career in the investment industry. At the same time, after years of careful planning, he opened his first gallery dealing exclusively in fine and historically important antiques on Main Street in the charming New England seaside village of Chatham. The collection on view at Kahn Fine Antiques was assembled after a lifetime of collecting. Now in his sixteenth season, Richard has attracted much international acclaim and has amongst his clients various celebrities, museums and historical societies. Over his entire collecting career, Richard has gone out of his way to do independent research on objects purchased. Without history, antiques are only silent objects. Richard loves to share his passion for history with prospective buyers so don’t be surprised if he tells you about one of his recent finds.